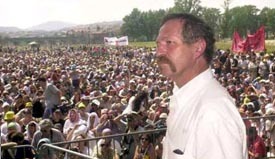 http://www.jewishworldreview.com -- JOSE BOVE, a French union official, went on trial last week in Millau, France. His plight and his crime have made him a hero at home and a celebrity abroad. Some 15,000 well-wishers congregated outside the courthouse. A concert in support of Bov and his defendants attracted 45,000 people. While on bail he dined with French politicians and held court for intellectuals, journalists and celebrities from around the world. His team of lawyers (led by a human-rights warrior) has -- like his bail -- been subsidized by wealthy American sympathizers. What, then, is this martyr's crime? He led a goon squad armed with crowbars and destroyed a McDonald's. French prosecutors want a "token sentence" of 10 months jail time with nine months suspended. Somehow this fast-food chain has become, to paraphrase Ronald Reagan's felicitous phrase for the Soviet Union, the focus of evil in the modern world. If you're anti-WTO, anti-America, anti-capitalism, anti-globalism, anti-biotech - pretty much anti-anything --- it's likely that Ronald McDonald is your pi–ata of choice. Foes of Mickey D's love to put a "Mc" in front of any word they think is bad. Signs denouncing "McGreed," "McPollution" and corporate "McDomination" are staples of left-wing protests everywhere. And, of course, we're used to the welfare state warrior's favorite -- "McJobs" -- presumably because they think "job" is a bad word, too. But it's not just name calling. In the last year, franchises in Switzerland, England, Belgium, China and the United States were targets of protests, boycotts, ransackings and even bombings. In the last five years, Golden Arches in more than 50 countries have been attacked. Obviously, for many people, McDonald's equals America, and our unrivaled dominance puts a bee under their berets. But anti-Americanism only explains a slice of the phenomenon. For example, around the world protesters often attack Mickey D's even if the U.S. embassy is more convenient. No, the truth is the Golden Arches stands for something distinct. Call it McDonaldsism. What does McDonaldsism stand for? Well -- to borrow a phrase from Burger King -- it stands for "having it your way." Many perceive McDonald's to be a plague-carrier, bringing the pestilence of Western consumer culture and low standards into every quaint hamlet. The reality is exactly the opposite, McDonald's sprouts up wherever there is enough economic oxygen to sustain it. David Halberstam argues in "The Fifties" that McDonald's was a product of post-war American prosperity. Young families flocking to the suburbs -- often with both parents working -- wanted a fast, clean, affordable place where they could bring the kids. If the kids got unruly, they could eat in the car. Indeed, for all the silliness about McDonald's exploiting women, the chain was an unsung hero in women's liberation, allowing overworked mothers an opportunity for a convenient meal. One of its first slogans was "give mom a night off," which later became "you deserve a break today." When Golden Arches go up, it's a sign that a country is raising its standards. Economic ministers and small-town mayors alike often boast about their Mickey D's. Indeed, because McDonald's is a canary in the coal mine of economic success, franchises generally must live off the land where they sprout up. Despite the fact that French farmers are McDonald's chief antagonists, France's 800 McDonald's buy 80 percent of their ingredients on the French market, sustaining 45,000 French beef producers. The other 20 percent of ingredients come from the European Union. Around the world, it's unusual for McDonald's management to be foreigners. The head of McDonald's in France, for example, is a besieged Frenchman. One needn't love McDonald's to realize its opponents miss the mark. Its profit margins are notoriously low and its products affordable for even the poorest. Its "low-paying dead-end jobs" are usually well above the minimum wage. And how dead-end can they be if one in eight Americans have worked at McDonald's at one point in their careers? Over half of McDonald's management were hourly employees at some point. At its core, anti-McDonaldsism is really a form of elitist nostalgia. Bove understands this, saying, "McDonald's is a symbol of industrial food production. Whether such products are American or French, the effect is the same: the destruction of traditional farming, different cultures and ways of life." Bove is confused, but he's honest. McDonald's is an indication of national per-capita wealth just like BMWs, cell phones and bottled water. When people want to get rid of McDonald's, what they really want is to turn back the clock, often with crowbars.